Heading to Disney World? 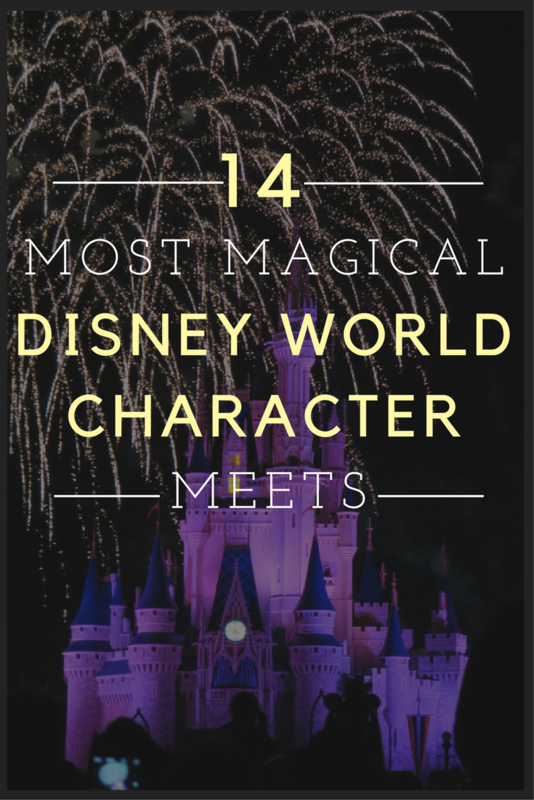 Make sure you put meeting the most magical Disney World Characters at the top of your to-do list! It’s no secret that my family and I are Disney World addicts. We go three times a year or more and both of our girls try to go at least twice a year. So you could say we’ve been around the Disney World block a time or two. 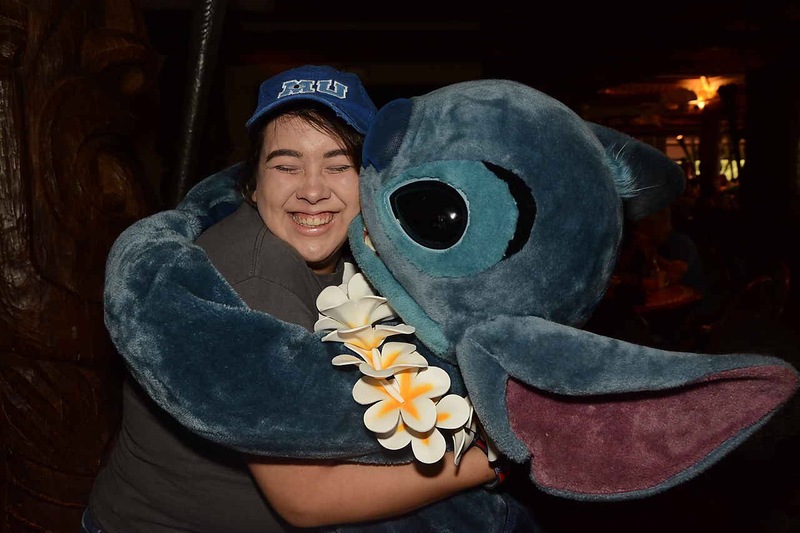 Our very first trip was a gift to Lauren for her 21st birthday and she ended up spending over half of her first trip waiting in line to meet as many Disney World characters she could. I will tell you this there is NO way you could ever meet every character Disney has to offer unless you live there for a whole year and then even then you’d have to be very luck to meet some of those characters. Case in point I met Robin Hood by chance at Hollywood Studios when he was coming out of the Fantasmic fireworks show. We’ve met our fair share of Disney characters over the years, and I want to share the very best of the best. 1-Joy and Sadness. 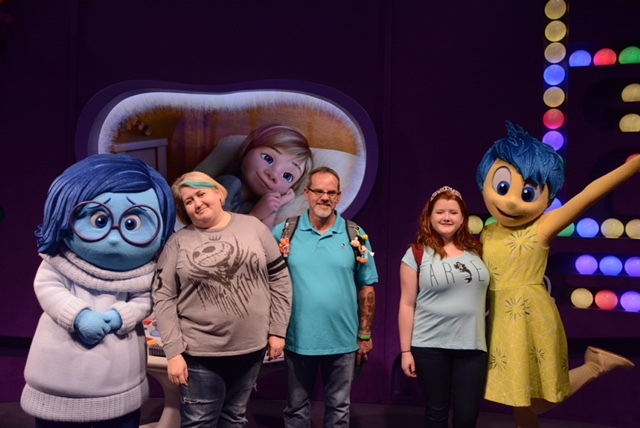 They are found at their permanent meet and greet location inside of Epcot and they have their own photographer. Typically Disney World characters inside suits are a little boring because they can’t interact the way speaking characters can but Joy and Sadness make up for it by having tons of energy (on Joy’s part) and really acting out their characters. Some Disney World characters have Fast Pass lines, but Joy and Sadness are not one of those characters. I’ve found, though, that their line isn’t typically longer than 45 mins and they are totally worth the wait. 2- Baymax. He’s found in the exact same character meet spot as Joy and Sadness. His line is also not usually very long and does not come with a Fast Pass line and he also comes with his own photographer. My grandson Brady loves Big Hero 6 (and so do I) so there was no way we were getting out of meeting him. Baymax doesn’t speak but he makes up for it with his movements and manners with you. If you do meet Baymax you have to give him a fist bump- he does the bah-la-la and everything! Make sure to give him a hug and enjoy his marshmallow fluffiness. 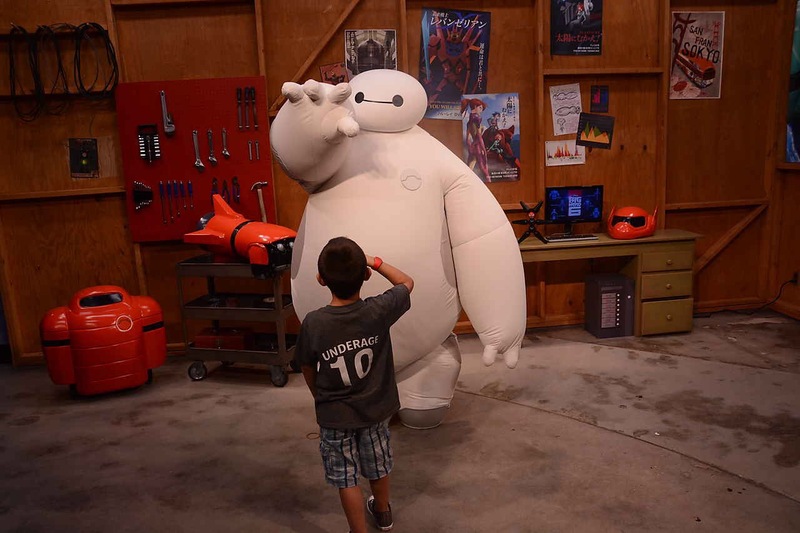 Baymax was one of Brady’s favorite Disney World characters to meet and he still talks about it. 3- Tinkerbell. She has her own spot at Magic Kingdom in the same building as Magic Mickey. Tinkerbell can be Fast Passed and has her own photographer. Before you meet her you have to be “shrunk down” to her size and have to go through the magical process. It adds a cute touch and keeps the magic alive for little ones. Tinkerbell is super cute and fun to meet. 4-Lilo & Stitch. Lauren’s favorite character is Stitch so we’ve mastered on how to find them. They can be found a few different places but the easiest way to meet both of them is to get reservations at Ohana. The only downside is booking Ohana can be tricky (Check out my 52 Genius Disney World Hacks to see how to get “ungettable” reservation.). But you can meet Stitch at Magic Kingdom, you’ll have to constantly check the app, but he tends to hangout at the character spots that are right inside the entrance or hanging out by the People Mover in Tomorrowland. He can also be met at Typhoon Lagoon from time to time and other than at Ohana, Lilo can only be met at Typhoon Lagoon. They are both non-speaking but they make up for it with how they choose to interact with you. Lilo is sweet and will dance with you and tell she loves you or certain things you are wearing. Stitch however likes to laugh and play around with you- he’s mischievous after all. If you meet them at Ohana you don’t actually meet them at the same time because it’s a character meal. They come to your table one at a time, but they spend a little more time with you than they typically would if you were in a line. They hang around your table until they feel like you’ve gotten enough time and photos. 5- Jack & Sally. One of my all time favorite Disney World characters to meet is Jack. He’s fun and very interactive. You can only meet him two times a year and only at the extra-ticketed holiday parties but you can only meet Sally during Mickey’s Not So Scary Halloween Party. Unfortunately they don’t do signatures so you just get a pre-signed card and they do not have a fast pass line. Jack and Sally do come with a photographer though and they are both speaking characters and super fun to talk to. For extra fun ask them about Zero and other Halloween town characters. 6- Tiana & Rapunzel. They are usually on the same side of the Royal Princess Hall in Magic Kingdom because they like to keep the new princess on one side and the classics on the other. You can Fast Pass them and they both have their own photographers. As a general rule most of the Disney Princesses are fun to meet but Tiana and Rapunzel take the cake. Though, Tiana and Rapunzel are fun on their own, they are way more fun with their princes. 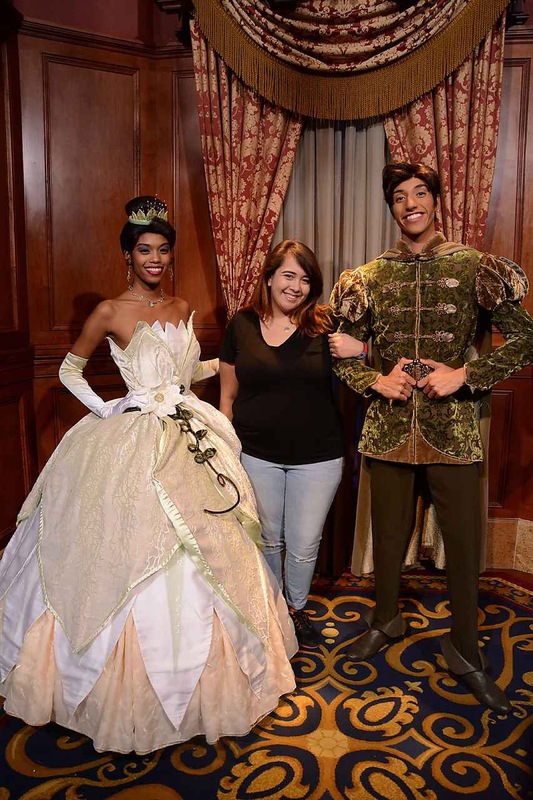 Unfortunately the only time you can guarantee meeting Prince Naveen and Flynn Rider is during the holiday parties. 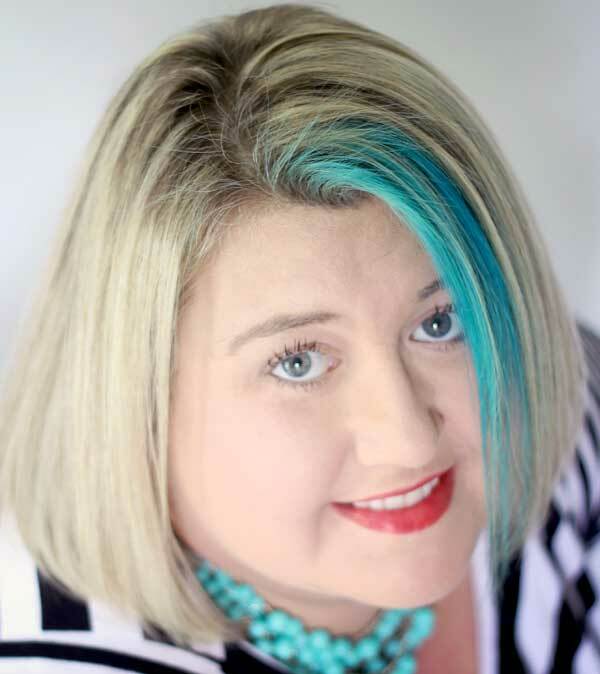 Tiana is funny and sassy, she likes to tell you about New Orleans and beignets and the only way her accent could be any better would be if it was real. Rapunzel is perky and sweet, she’ll go on and on about Pascal, Maximus and Flynn. 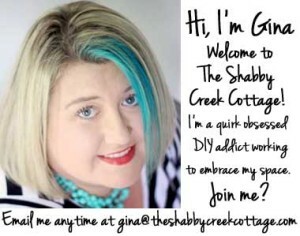 They are entertaining and funny and worth Fast Passing. 7- The Original Gang. Mickey Mouse, Minnie Mouse, Goofy and Donald Duck are a staple when it comes to Disney World Characters meet and greets. You can find all them individually through out all of the parks but the easiest way to meet them all at once is to go to the Character Spot at Epcot. This spot in particular does have Fast Pass option and comes with a photographer but that doesn’t apply to all the other places you can meet them, again making this the easiest place to meet them all. None of the Original Gang talk but are all very energetic and stay true to their characters. Mickey is cheerful, Minnie is sweet, Goofy is silly and Donald likes to throw tantrums. I’ve found that most Epcot Character wait times are not very long and this one is no exception I would recommend not wasting a Fast Pass on this Character meet. 8- Rafiki. Occasionally you can find him lurking about in Adventureland in Magic Kingdom but he doesn’t have any set schedule or a photographer. It’s easiest to meet him at Rafiki’s Island in Animal Kingdom, which you have to take a train to get to but it gives you a interesting behind the scenes look at Animal Kingdom. Rafiki’s Island is where they house the reptiles and bugs and it’s also where they operate on the animals at Animal Kingdom, so check the schedule posted near the operating room and you might get to see an animal getting a check up through the observation window. Rafiki’s Island also teaches little ones about the importance of conservation and they have a live animal right in the center of building every 30 mins where they tell you interesting facts. It’s also home to the petting zoo and Rafiki himself. Though he doesn’t have a fast pass line; he does have a photographer. The wait is usually not much longer than just a few people which is a same because he’s so much fun to meet. Rafiki doesn’t talk but he likes to play around with you tell his handlers funny things about you. 9- Green Army Men. They are not official characters to meet but they are a lot of fun to play around with. They are usually just roaming around the Toy Story are in Hollywood Studios and don’t have an official photographer but encourage photos and will give autographs. I think they are my favorites to meet. 10- Evil Step Mother and Step Sisters. Though they don’t have any exact schedule or meet and greet spot, if you check the My Disney Experience app you’ll eventually see them at some point during the day. Typically they are hanging around the back of Cinderella’s Castle at Magic Kingdom. They are out in the open and can’t be Fast Passed but they typically have a photographer with them. Though it may not seem like fun to be picked on and watch people argue around you the Evil Step Mother and Step Sisters are some of the most fun characters to meet. The sisters like to pick apart what you are wearing and like to trash talk while the Evil Step Mother likes to yell at her daughters and look down on you. It’s hilarious! 11- Gaston. He can be found around his tavern in Magic Kingdom. Gaston is another of the Disney World characters that you’ll have to check the app and see his meet and greet times. Since he is another character that’s just out in the open he also doesn’t have a Fast Pass line but he does have a photographer. Gaston is just like he is in the movie-full of himself. He like to mention his good looks and tell you how foolish Belle is. Gaston is one of the funnier Disney Characters you can meet and is totally worth it if you can track him down. 12- Peter Pan. 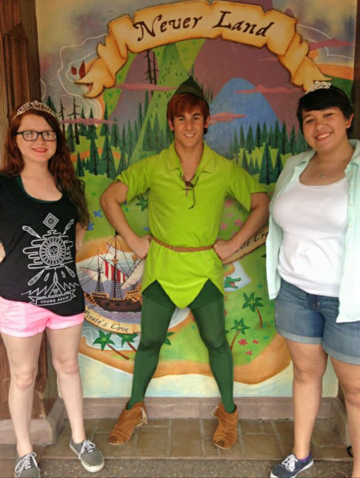 My daughter Hannah swears that Peter Pan is one of the most fun Disney World Characters you can meet. He also is out in the open, so no Fast Pass, but he comes with a photographer. Though you might catch him randomly through out the park the most likely place to meet him is near Peter Pan’s Flight in Magic Kingdom. Unlike the other characters that are out in the open Peter Pan usually has a line waiting for him at his typical character spot. He’s one of the more popular characters to meet so you’ll have to wait a good 30 mins or more to meet him at times but when you do meet him he’s fun and sweet and silly. 13- Mary Poppins. She’s another one of my favorite Disney World characters to meet. You can find her at Epcot in her character meet spot in England with her photographer. She’s quite proper and sassy, I made the mistake of asking her handler if she does autographs and Mary answered before her handler could even get a word out. Mary Poppins is so much fun. 14- Chewbacca. 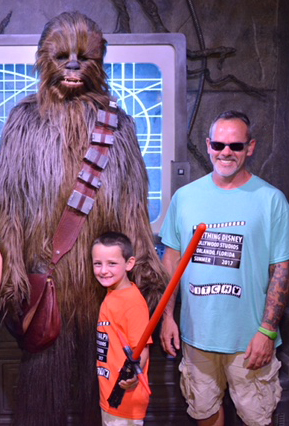 Chewy can be met at Hollywood Studios at the Star Wars character meet spot. Obviously he doesn’t talk but he does do his Wookie yell and he can’t be Fast Passed but it’s totally worth the wait. Brady was terribly scared at first but once he got over the shock he was blown away. He still talks about him. 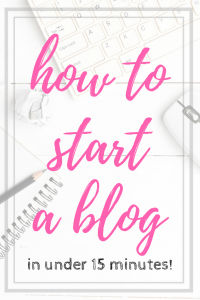 If you’re headed to Disney World for the first time, make sure to check out my favorite tips. Which of one of the Disney World characters is your favorite to meet?